Editors' Note: The responses below from Ms. Maura Moynihan and Mr. Pema Gashon are being published simultaneously. Ms. Moynihan's article is in response to Mr. Gashon's earlier article, and Mr. Gashon was provided an advance copy of it in order to write his response. The TPR editors asked the authors to make this their final statements on this issue. 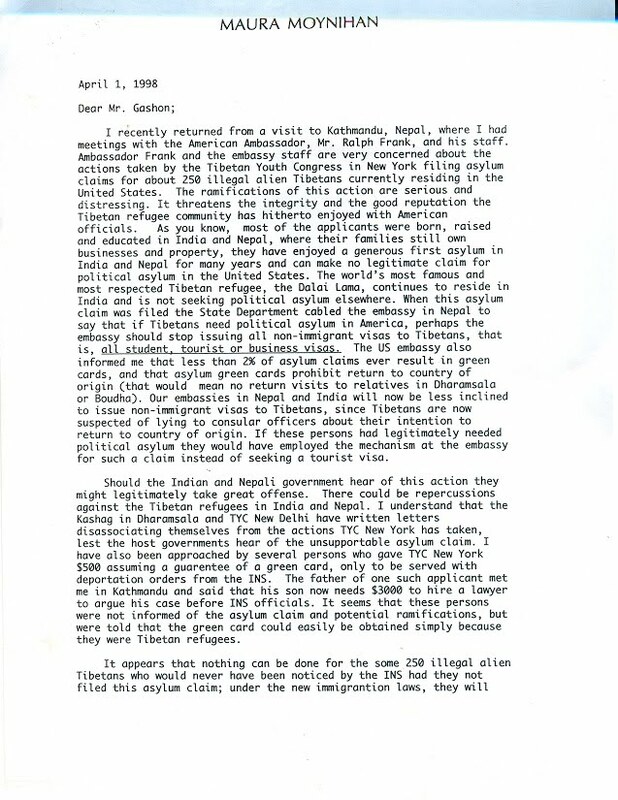 Mr. Gashon did not offer me a fee for an ethical or legal transaction: he was asking me to falsify the record of the humanitarian care given to the Tibetan refugees, by India, a country where my father Senator Daniel Patrick Moynihan served as US Ambassador. Thus the offer can only be construed as a bribe. At the time Mr. Gashon was pushing this scheme, I received several calls from US State Department officials who had been contacted by Mr. Gashon and wanted to know if Tibetans in India were in fact abused and endangered by their Indian hosts. I provided extensive documentation to show that India had for years provided generous sanctuary to the Tibetan people and HH the Dalai Lama, which Mr. Gashon also notes in his post to TPR. Mr. Gashon was fortunate to win the lottery and settle his family legally and securely in the US, but his asylum scheme has caused irreparable harm, which State Department officials sympathetic to the Tibetan cause warned of. Because so many Tibetans have entered the US on tourist, student or business visas, and then made asylum claims, it is virtually impossible for Tibetans to get visas from the US Embassy in India. Even Fulbright scholars cannot get a fair hearing. 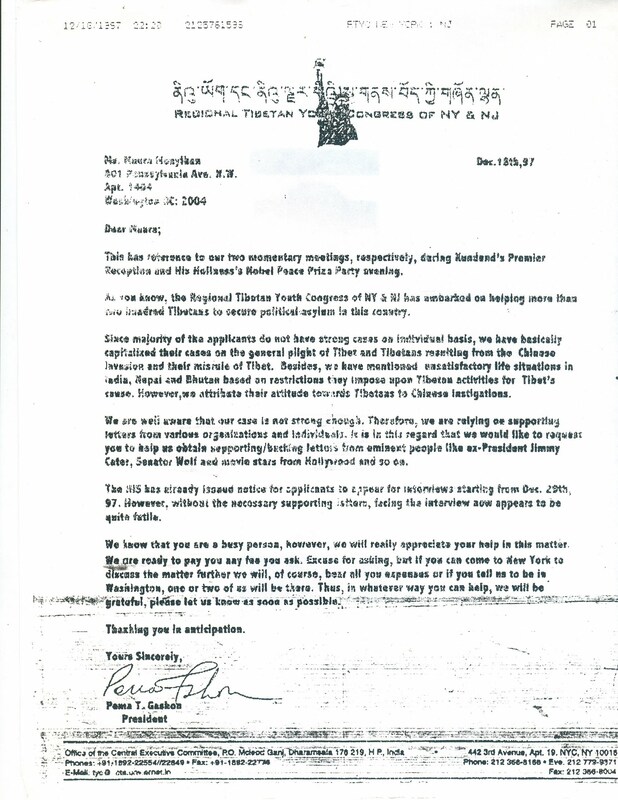 Mr. Gashon writes in his TPR post: “I challenge Ms. Moynihan to name just one person who was taken advantage of by me.” In my 04.01.98 letter to Mr. Gashon I wrote: ““I have also been approached by several persons who gave TYC New York $500 assuming a guarantee of a green card, only to be served with deportation orders from the INS. The father of one such applicant met me in Kathmandu and said that his son now needs $3000 to hire a lawyer to argue his case before the INS officials.” The father of Mr. Gashon’s client who was threatened with deportation by the INS is Mr. Thinley Gyaltsen of Kathmandu. My TPR post “The High Cost of Protracted Refugee Syndrome” has a video clip of HH the Dalai Lama in Ladakh where he states that he had to apologize to the US Embassy in New Delhi because so many Tibetans in the US made fake asylum claims against India, and he asked that people not take such actions. That HH the Dalai Lama had to do damage control for the visa brokers and hustlers who abuse his good name is sorry proof of how actions like those of Mr. Gashon have caused tremendous harm to the thousands of poor Tibetan refugees in South Asia. I would like to clarify certain facts by responding to Ms. Moynihan who is bent to put all the blames for “damaging” Tibetan image on me as the president of RTYC, which helped fellow Tibetans whose condition in New York was best described by Ms. Moynihan, I quote from her, “Tibetans in India: A Case for Citizenships”, she says referring to Tibetans, “In New York, underpaid, overworked and oftentimes abused by their employers, but trapped because they are illegal aliens and they do not know where to turn to get sound advice or how to get citizenship”. We helped such helpless people. Besides being highly vulnerable and helpless, because of lack of proper papers, their fear and anxiety increased at one point in time by a rumor that a certain paper in India published that the US Government was going to deport all illegal immigrants from India back to India. At one of the Tibetan gatherings, Ms. Moynihan admonished me in public that helping Tibetans obtain legal documents was a bad idea because it would harm Tibetan culture, religion and language and so on. That was her own opinion and I respected it because I believed she was saying it with good intention and she meant well. After all she is a strong Tibetan supporter and I respect her for that. But soon I learned that she has been helping some Tibetans too. So when the next time I met her at another gathering I had to ask her why she did not practice what she preached others. She did not deny it. 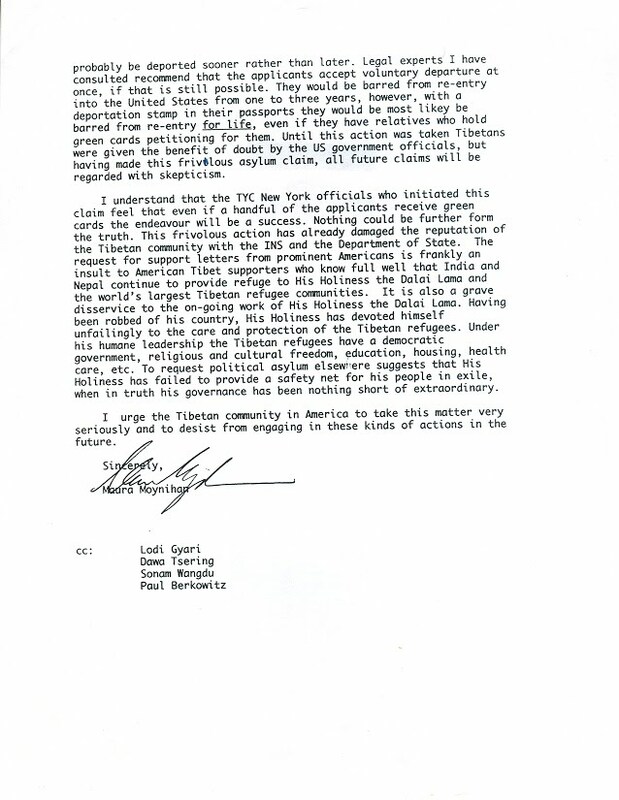 If helping Tibetans obtain legal paper was bad Ms. Moynihan’s issuing supporting letters to some Tibetans was equally bad. I reemphasize here that we helped only those who were already in the country without papers. Ms. Moynihan keeps insisting that I “bribed” her. Although I don’t have to justify or defend myself a little clarification with an example of Tibetan mentality may help. When Tibetans ask help from someone and do not know what trouble or how much money the act of helping is going to entail we say something like, simply put “Do–song gatsoe dona-yang ful-chok”. “Whatever expenses it incurs will be reimbursed”. No Tibetan calls it “bribe’. Plus we offer some gifts as a gesture of appreciation. Just because Ms. Moynihan happens to be the daughter of the late great Senator Daniel Patrick Moynihan, whom I have great respect, “The offer can only be construed as bribe”, according to Ms. Moynihan. But If the same offer was made to a common person, then does the nature of the offer change? Ms. Moynihan quoted “Mr. Gashon bribed me, in writing, to tell “lies” and falsify the record of humanitarian care given to Tibetan refugees by India”. Untrue, read my letter reproduced by her. Thousands of people say very degrading things about their own governments and people while seeking asylum. The RTYC and I as its president said nothing degrading about India. Again read my letter. Regarding India our petition was based on actual facts of Tibetan refugee status in India substantiated and evidenced by paper clips somewhat like on the lines of what Ms. Moynihan writes about the conditions of Tibetans in India, “How does keeping thousands of people in a decaying camp system, unable to work, vote, buy a house or register a business in the country.” She further says “Without an RC, these new refugees live in fear of the Indian authorities”. Ms. Moynihan did not answer my challenge to name just one person that I took advantage of and obtained money from because she said that I received a large sum of cash from asylum seekers but did not give them papers. Even the President of America has no power and right to give green cards to anyone at his will. T. Gyaltsen’s case is not the answer to my challenge. I am sorry he received deportation threat. Unfortunately, it’s part of the game. Sometimes even the highest paid immigration layers cannot protect their clients. Therefore, we have emphatically forewarned of such possible consequences to all both orally and in written form. We made sure all applicants read the warnings and understood them and then sign for RTYC service. It is good that Ms. Moynihan produced her letter dated 4/1/1998 in response to our letter dated 12/13/97. See the 14 months gap between the 2. But we did not receive it therefore I even made a follow up call. There were two possibilities though. She may have forgotten to post it or posted but went astray because due to financial constraints, we changed office locations several times. Even if we had received it the letter would have had no impact on our work because by April, 1998, the RTYC office already stopped accepting applications, we were wrapping up our tenure of office. It is interesting that although Ms. Moynihan states, I quote, “Visa brokers typically charge 10-15 Lakhs of Indian Rupees, equal to 40 to 60 USD. There are several large rings operating in Asia, Europe and the US” but she never mentions either individual or group or organization’s names except mine. Instead she provides a video clip and Ms. Moynihan writes something that HH does not say in the video clip. In the video clip, His Holiness states that he had to apologize to the US Embassy in New Delhi on behalf of some Tibetans who sought supporting letters from His Holiness’s Office in Delhi by making false promise to return from America and telling lies to the US Embassy. But, Ms. Moynihan writes His Holiness Dalai Lama as saying in the video , “I(Italic is mine) had to apologize to the US Embassy in New Delhi because so many Tibetans in the US made fake asylum claims against India” Misinterpretation, His Holiness does not say it all. But I think she wrote it just to associate me with those hustlers or liars who caused HH to apologize, and whose behaviors and activities truly damage Tibetan reputation for she is hell bent to tarnish my integrity in whichever way she could, I don’t know what her motive is. But I hold nothing against her. My conscience is clear. Tibetans who know about the work of the RTYC are supportive of us. The RTYC was able to legally resettle some 80-100 needy fellow Tibetans who were able to bring their families into this land of opportunities. I feel happy with what the RTYC of NY&NJ did during its two year service. We stand with what I said in my article. If in fact some damage was done it was because some people unnecessarily stirred up the issue without any solution. But I believe no serious damage was done otherwise more 10,000 Tibetans could not have entered America since around 1997. People are still coming in. So we no longer want to talk more about something which is already 15 years old.